SEA is an isothermal nucleic acid detection technology mediated by denaturation bubble, which utilizes natural strand “breathing” to open up dsDNA. Similar to PCR, the SEA technology can trigger exponential amplification of target nucleic acid regions by designing only a pair of upstream and downstream primers. The reaction principle of SEA is different from that of PCR. 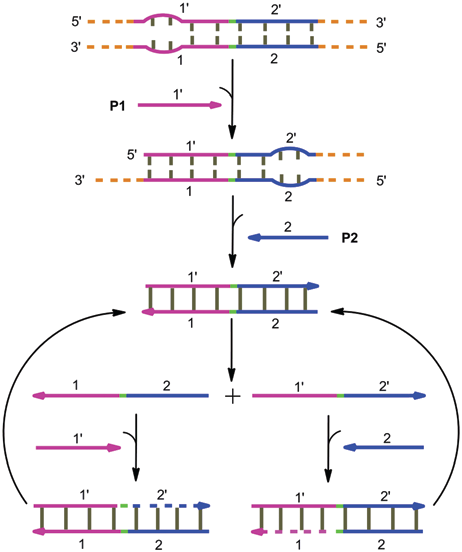 PCR reaction opens the dsDNA through high temperature, triggers primers to combind with formed single strands after cooling, and then to perform extension and amplification(variable temperature, requiring heating and cooling instruments). However, the primers of the SEA reaction invade denaturation bubble structure at constant temperature, trigger the exponential amplification by extending and replacing the original chain under the activity of polymerase((isothermal, independent of heating and cooling instruments).